Updated 27 September, 2011 – see section: ‘The meals‘. Updated again 28 September, 2011. Click here to go to this update. To date Libya has been subjected to decades of foreign meddling and attempts to assassinate and oust its leader Muammar Gaddafi. Throughout this time, foreign-based Libyan opposition groups and globalist propaganda mills have incessantly cited supposed atrocities committed by Gaddafi, and none is more infamous or overused than the ‘Abu Salim prison massacre’ of June, 1996. This is now being invoked yet again in an attempt to justify the brutal war being waged on the people of Libya. The events of the ‘Abu Salim prison massacre’ are based on two reports – one from the New York based, globalist-funded Human Rights Watch, and one from the CIA-Mossad-created National Front for the Salvation of Libya (NFSL). The backgrounds of these organisations lend them zero credibility and in addition, their reports are based on nothing more than the testimony of two people – one named and one anonymous. Openly admitted by Human Rights Watch, none of the claims made by their witness can be independently verified. On top of this, their witness states on record that he did not witness even one single prisoner being shot dead in this supposed massacre. Furthermore, as I will demonstrate, the reports are riddled with contradictions and weaknesses. All in all, these factors and the historical context that surrounds them, utterly expose the contrived nature of the ‘Abu Salim massacre’ story. The story begins in Abu Salim prison complex, Tripoli, in June, 1996. After several successful and unsuccessful escape attempts mounted by prisoners in Abu Salim over the previous years, security was increased at the complex and living conditions worsened for the inmates. With one guard laying injured on the ground in the courtyard, and Omar Fathallah having been killed by the prisoners, a negotiating team arrived at the prison to discuss the prisoners’ demands. Crucially the NFSL report does not mention the fact that Omar Fathallah was killed by the prisoners; only the HRW report does. In this deliberate omission, the NFSL report fails to even mention the fact that Fathallah died at all. With the negotiating team having arrived at Abu Salim, the prisoners were told to designate representatives from each block. A condition of the negotiations was that the two hostages would have to be released by the prisoners. The injured guard held hostage in the courtyard was released, but Omar Fathallah had already been killed. The prisoners presented their demands to the negotiators after agreeing to return to their cells. Referring to the ‘bus executions’, HRW’s report cites the NFSL report and claims that “many of them were executed“, but offers no numbers or details. Conflicting timelines: when did the ensuing ‘massacre’ actually occur? The NFSL report then speaks of how, in the evening of ‘Friday June 29th’ (again, June 29th, 1996, was actually a Saturday), prisoners were herded into the courtyard of the prison and then the ‘massacre’ began at 11:00pm that night. However, HRW’s report states that Omar Fathallah was knocked unconscious and the violence erupted at 04:40pm, June 28th. Their witness then claims that the ‘herding’ happened at 05:00am on June 29th, and the ‘massacre’ then began at 11:00am that morning. According to the NFSL, the ‘massacre’ began at 11:00pm on June 29 when hand grenades were thrown into the courtyard and firing began. HRW’s different timeline tells of how the ‘massacre’ continued from 11:00am until 01:35pm on June 29th. Then, apparently, guards began ‘finishing off’ prisoners with pistols at 02:00pm. Not having actually witnessed a single prisoner being shot in the ‘massacre’, star witness al-Shafa’i provides HRW with an estimate of how many were allegedly killed “by counting the number of meals he prepared prior to and after the incident“. There are a number of problems with using this as a basis for calculating how many were killed. First and foremost, it would only constitute an indirect estimate, in the absence of any evidence of bodies or the witnessing of the alleged killings. Secondly, al-Shafa’i does not state the time period over which he counted the meals. Was it only the next day, or was it every day for the next month? There are a whole host of reasons why less meals may have been prepared after the incident. Perhaps prison logistics were thrown into chaos by the escape attempt and the killings of guards and prisoners, and as a result some meals were skipped. Perhaps prison authorities decided to punish the prisoners for the violent escape attempt, and skipped meals (cruel as this may be). More importantly however, are we supposed to believe that one man was responsible for preparing meals for a prison population of between 1,600 and 1,700 inmates? If one meal were to take just one minute to prepare, this would take al-Shafa’i 1,600 minutes – which is 26.6 hours. It would be literally impossible for one man to do this every day. At the same time, the only way a reliable estimate could be reached, would be if this one man did prepare all the meals himself (impossible), unless he had knowledge of how many were being prepared by other kitchen workers. Realistically for a prison population of 1,600-1,700, the only way to feed all inmates every day would be to have a number of kitchen workers, so let’s follow this line of inquiry. Let’s say there were a number of prisoners preparing meals every day – 35 prisoners preparing 50 meals per day, each – that is realistic. This would amount to 1,750 (the approximate total capacity of the prison). Let’s then say that after the ‘massacre’, al-Shafa’i perhaps was preparing 15 meals instead of 50. If he were to extrapolate this number out over the other prisoners that were preparing meals, we would arrive at an estimate of 1,225 less meals. However, this method of estimation would only be accurate if al-Shafa’i had knowledge that the other kitchen workers were preparing the same number of meals as him. He did not have this knowledge, because he estimated based on the number that HE was preparing. This is a typical tactic to manipulate the numbers in order to give the story a credible estimate, in the absence of any actual evidence. Moreover, al-Shafa’i claims that he was “asked by the prison guards to wash the watches that were taken from the bodies of the dead prisoners and were covered in blood”. Why did he not count the watches? This is not discussed in the HRW report. The idea that the bodies were moved is a convenient excuse for the 1,200 bodies not being found at Abu Salim – an eventuality that seems inevitable considering the laughably shaky nature of the whole story. The unelected lackeys and terrorists of the NTC are already trying to rekindle this fable with the help of the media. The charge that 1,200 were killed is supported by no physical evidence whatsoever, and on top of this, the single named witness on which the story hinges, did not even see a single shooting. Furthermore, as demonstrated, the testimonies of both witnesses are simply not credible and conflict with each other. For wider context we must consider an important factor. 1996 was a time when MI6 was mounting attempts to assassinate Muammar Gaddafi using ‘al Qaeda’ extremists to whom they paid a large sum of money. Abu Salim prison – and this is openly stated by the NFSL’s report – was used to house “members of a group from the city of Derna“. Derna is the very city mentioned in the infamous West Point report which found it to be a hotbed for extremist ‘al Qaeda’ fighters. These extremists had fought in Iraq and Afghanistan against the occupying forces. Furthermore, these very groups are now being supported by NATO in Libya in its attempt to oust Gaddafi – as they have been for at least the last three decades as indicated by Newsweek in 1981. It is not just probable but highly likely, that the violent break-out mounted at Abu Salim in June 1996 (which was partially successful) was related to the ongoing MI6 attempts to kill Gaddafi using the very groups that were being held in that prison. Ever since that time, foreign-backed Libyan opposition groups such as the NFSL, and globalist propaganda mills such as Human Rights Watch, have distorted and manipulated the truth about ‘Abu Salim’, in an attempt to both rally the extremist fighters opposed to Gaddafi, and justify the brutal, illegal war of aggression now being waged on Libya. 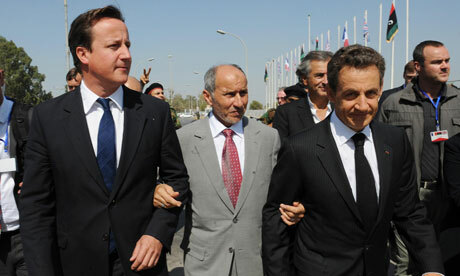 The number was also confirmed by the Libyan Secretary of Justice to Human Rights Watch in April 2009. For those that don’t know, Mostafa Abdeljalil is the Chairman of the NTC – nothing more than a lackey and a puppet of NATO and the powers now waging war on Libya. In case you forgot his face, he is pictured below. Excellent article, Martin. Thanks for putting it together. I’d like to mention another possibility for the lunch tray change (if it even happened) – what if app. 1,200 prisoners were transfered after the incident? Too many Islamist heads kept together managed to hatch their June 28 plot, so maybe they decided it was better to split them up to different prisons than keep them concentrated. This, like death, would cause missing lunches for an extended period. Either way, even if his count is true, as you say it’s not the best method for determining that people were murdered, and it’s alarming that was the initial evidence. I’m curious about his angle of view-how realistic is it to have seen the shooters on the roof but not their prey? Does he give a detailed description of where he was at the time and why? And another point that just arose-at my blog post, Felix has comments conveying later info, whereby the government seems to have conceded to over 1,100 killings – sort of. It seems on the surface like confirmation, but then again, they also seem to have admitted to Lockerbie,right? I have no position and I thank you for presenting a different take on events than I’ve read before. But I have to say something about a part of your piece that I thought was unnecessary and detracted from your argument. And that’s your meal preparation analysis. You question if one man could prepare 1750 meals but if he’s comparing before and after then his claim of counting the meals he prepares relates to the preparation of 525 meals, not 1750. He could’ve based the previous count of meals on the capacity figures which you yourself cite as the basis of your mathematical argument. Now if, as you say, it could take a man a minimum one minute to prepare a meal that’s just over eight hours. Also I think we’re talking just rice and something else here, so you could get that timing down to 30 seconds, less even. (From memory at Burger King you’re expected to make a Whopper in less than 40 seconds.) But let’s put that aside. It’s a silly argument. Thankfully we’re not privy to the machinations of that kitchen, but it’s rare to have more than one preparing preparing more than a single item in an industrial-size kitchen. The witness could’ve counted how many slops from a pot he made. The details provided by the witness of the guns and the uniforms of the guards compared to how light his testimony in relation to the killings is your best argument. I thank you for your piece but I sincerely suggest you tweak the meals section at very least because up until that point I was starting to really hear you. If you read up on other claimed atrocities, for instance, the farm warehouse massacre during regime change in Libya – the witness testimony bears a lot of similarity. You’ve only to look at the claims of mass graves in Iraq given by opposition groups which HRW were happy to repeat. No evidence of these mass graves have been found to date. In my possession, along with many other families,is a paper we recieved from the Gadaffi regime in 2008. It apologises for the unlawful death of my relative in the Abu Salim massacre and the regime offers blood money. It took nearly 13 years for this paper to be sent out to the victims families. If the regime were innocent of any wrong doing then why take all that time? If they were terrorists they would certainly not have offered blood money. This blood money, in libyan culture/tradition is only offered in cases of unlawful killings. Abu Salim did happen and not how you are trying to portray it. A mass grave has been discovered just outside Abu Salim with over 1,000 victims, hopefully DNA will finally give closure to the victims families. May Allah have mercy on your soul. link not working. not surprising now, had you downloaded it? can you publish it? In order to support NATOs war against Libya, the fabricated claim was used that the former Libyan government massacred 1200 prisoners in an uprising in Abu Salim prison in 1996. Western press made the claim that the massgrave of 1200 had been found. Only French journalists actually investigated the “massgrave”. They found only one dead and that was a camel! out and destruction of your country. I was born in Chile , and lived under Pinochet’s dictatorship so to Nadia, how come I don’t have any problem, by doing a simple google search, to come up with numbers, places, etc. of Pinochet’s killings, but all of Gaddaffi’s are alleged,and non corroborated by impartial entities? Let the stealing, the exploitation by the transnationals commence again, straight back to before Gadaffi.